For most folks, life these days feels busy. Busier than it ever felt before. I blame the Internet for everything; for making life feel so hectic, applying pressure to be and say and do and share all the time and it piles up incrementally until one day you throw your hands up in the air and say STOP! Arrange for some babysitting and make plans for a date night, call your girlfriends or wrangle the family together and tell them you’ve got a brilliant idea. To locals, a river cruise is something you do when you’ve got friends visiting from abroad or your nan is celebrating her 70th birthday but I urge you to rethink the notion that it’s an experience that should be saved only for special occasions and consider your own well-being, relaxation and pleasure as reason enough. You deserve the opportunity to step off dry land and be taken by the current, past houses and fields, hotels and fishing rods, past trees and grasses and bridges and out of the chaos of life. If only for a few hours. Being on the river, mesmerised by the flow of the current, the passing scenery, knowing you’ll be at your table with nothing to do and nowhere to go for the next few hours; it has the most wonderfully calming effect. You can settle into your chair, lean back and let the views be your focus as the conversation unfolds without pressure. All you have to do is sit back and enjoy the meal as it’s bought to you in stages, perfectly paced to match the rhythms of the river. I did this very thing on Saturday night with Bateaux Cruises in Windsor. Boarding Thames-side just near the Eton bridge, Bateaux are now cruising for the season, taking bookings for lunches, afternoon teas and dinners. This is a food blog, and I do like to talk about food but I’ll admit that I don’t normally get on a boat with gastronomy in mind. 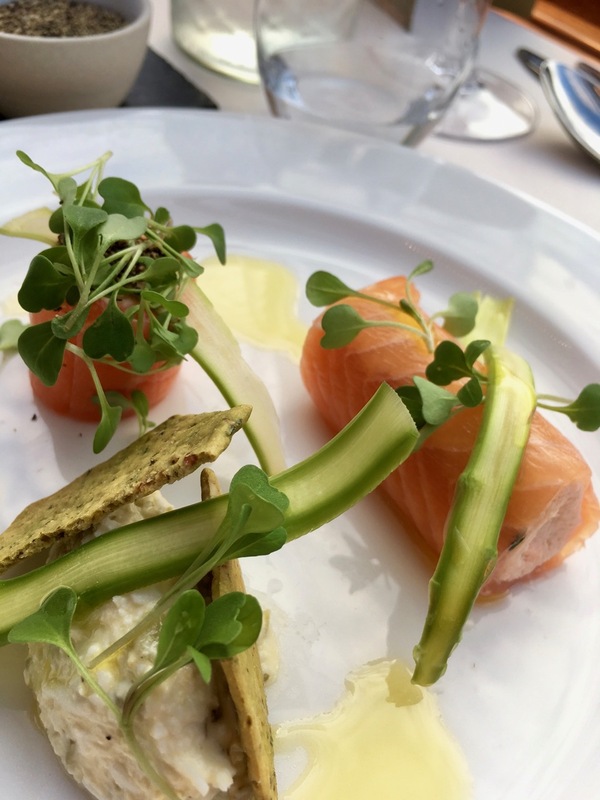 However, Bateaux pride themselves on putting the food first, describing themselves as a moving restaurant. And with fair cause, they’re offering up a meal of the highest standard I’ve ever had on the water. Beautifully set tables, white linen, timber decor and the utmost of nautical elegance, The Melody takes you through Boveney lock and all the way up to Bray Lock. By that time you’ve sipped on an amuse bouche of wild garlic veloute with parmesan tuile, made your way through a starter of smoked salmon, asparagus and sauce gribiche and probably just finished the main course of roasted lamb rump with potato confit, spring greens and creamed leeks. 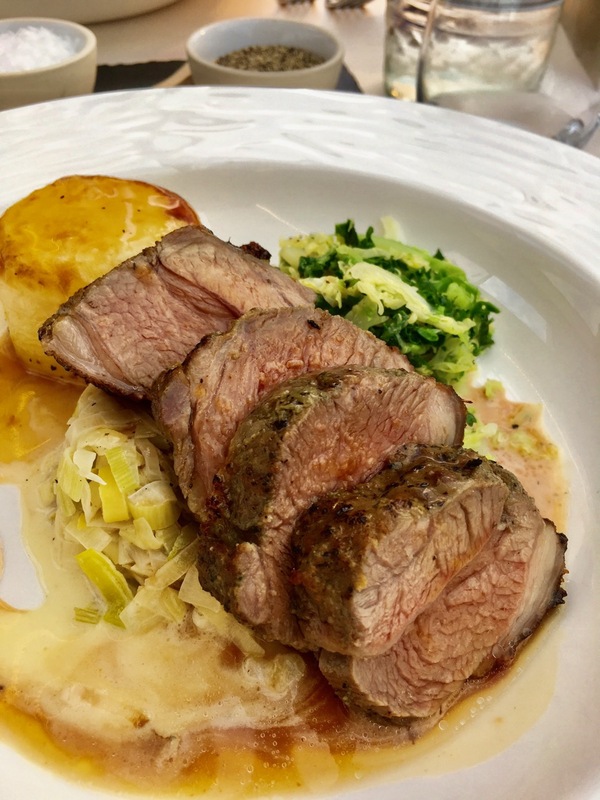 You’ll be impressed that lamb so juicy and tender can be conjured from the tiny floating kitchen and you might even be on your second glass of wine as the boat turns around and heads back to Windsor. By now the sun has set and the light has softened as you sail through the gloaming. The groups of fishing men have lit their fires on the shoreline, children are scampering across the riverside gardens of Oakley Court and the luckiest of all with riverside homes are sipping wine in their summer cabins, lighting candles and tiki torches as the light grows dim. Of course dessert follows, then some Cornish brie and likely some sort of fortified tipple if you go that way, we ordered a gin and tonic for the final lap and felt perfectly at ease and fully relaxed as we sailed on into the night. 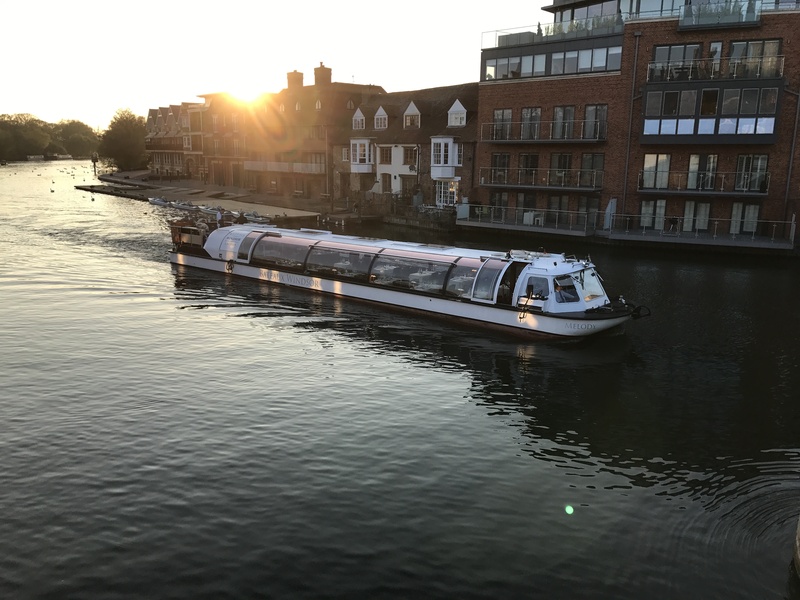 If you’re tempted to experience for yourself, the delights of fine-dining on the Thames with Bateaux, they’re offering a special discount of 25% off all Friday night dinner cruises in July for Feeding Time Blog readers. Simply use the code ‘Fri25July‘ when you book. Visit www.bateauxlondon.com/windsor to make your reservation, alternatively you can email the team at reservations@bateauxwindsor.com or call 01753 202 302.